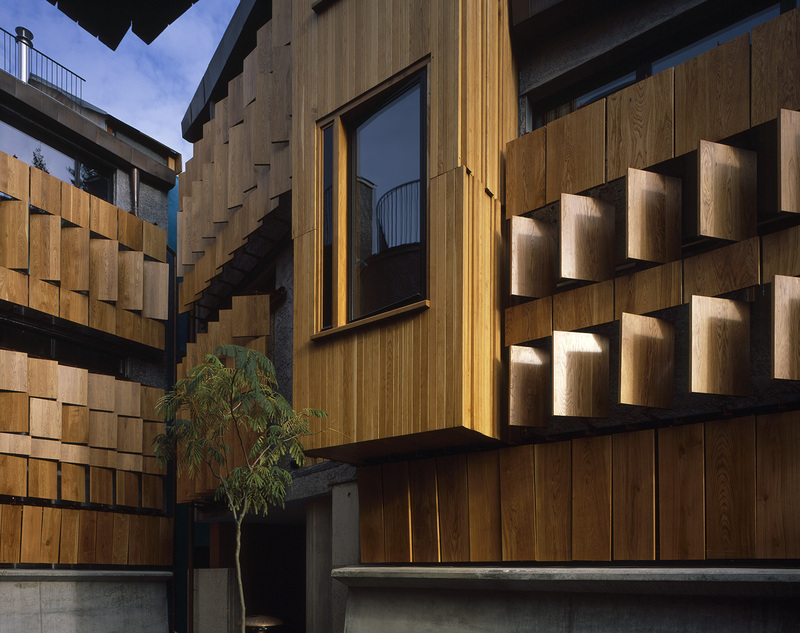 Walmer Yard by Peter Salter. Courtyard looking north with shutters closed. 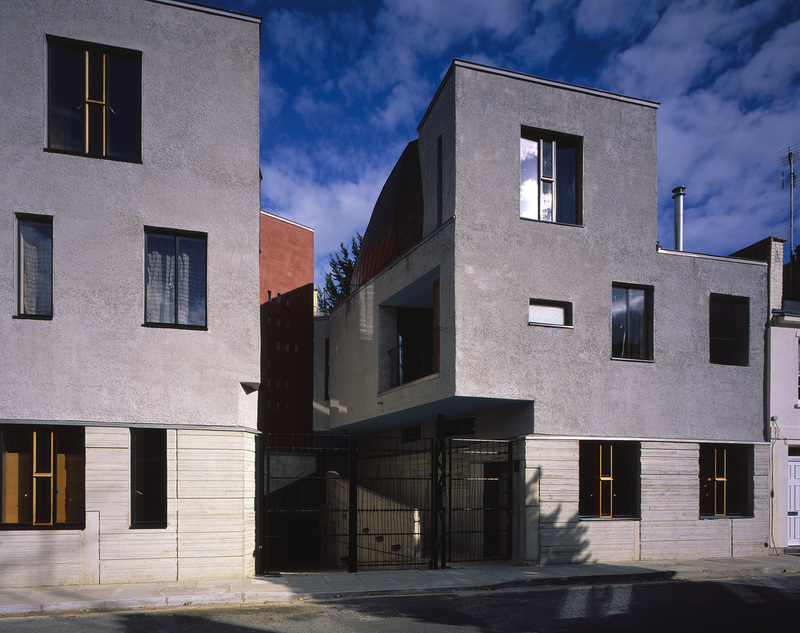 Walmer Yard by Peter Salter. Courtyard detail of shutters partially open. Walmer Yard by Peter Salter. 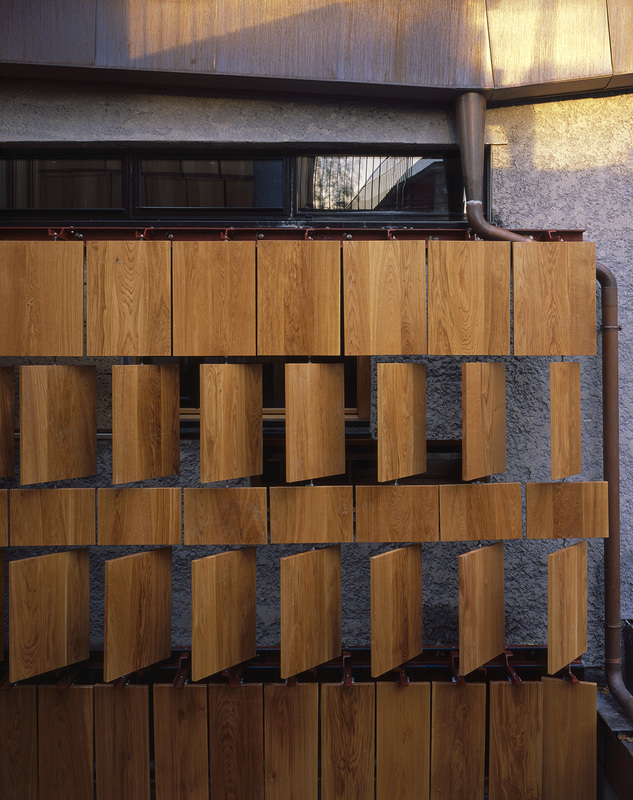 Courtyard detail showing staggered panels of timber shutters. 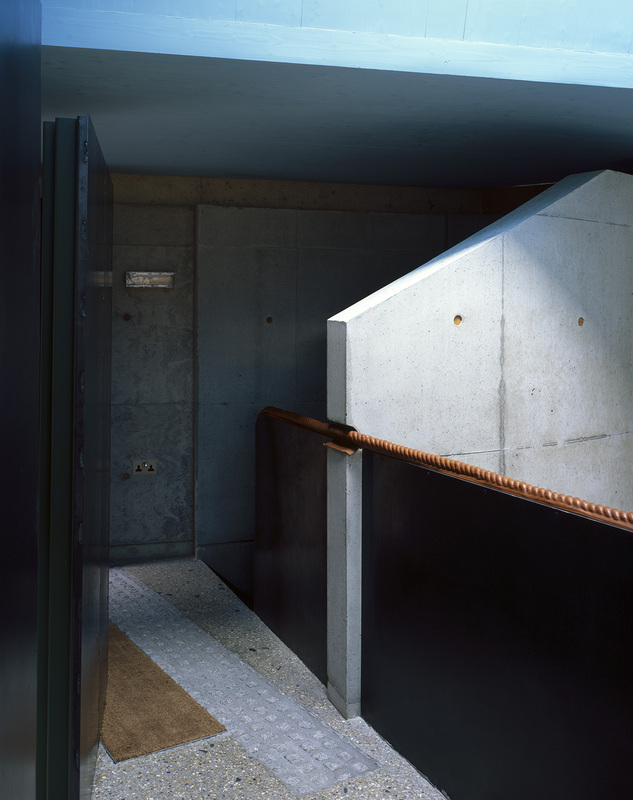 Walmer Yard by Peter Salter. Shuttered elevation giving privacy to bedrooms. 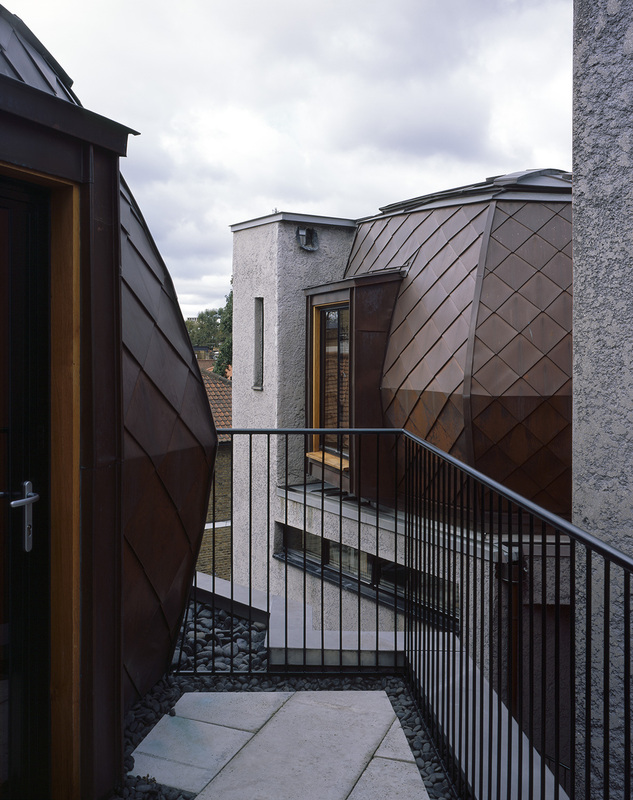 Walmer Yard by Peter Salter. Muted facade onto Walmer Road. 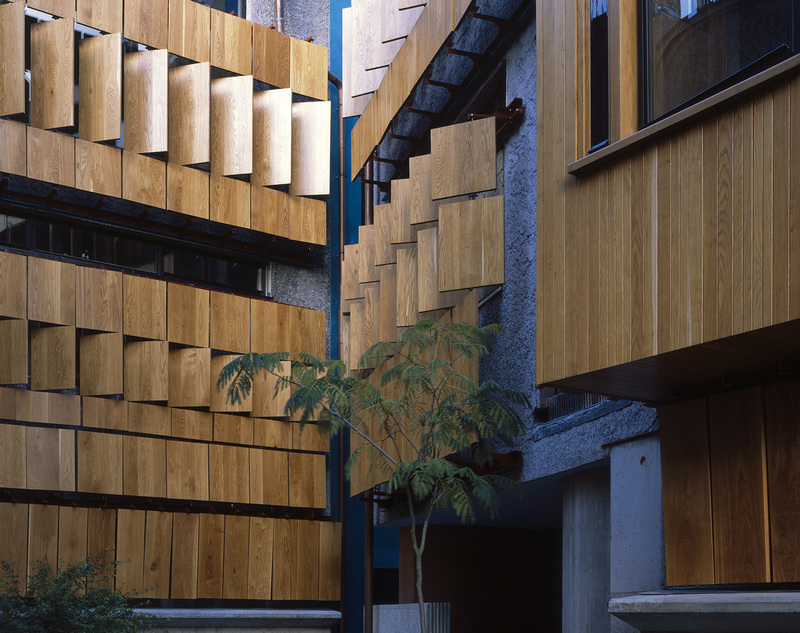 Walmer Yard by Peter Salter. 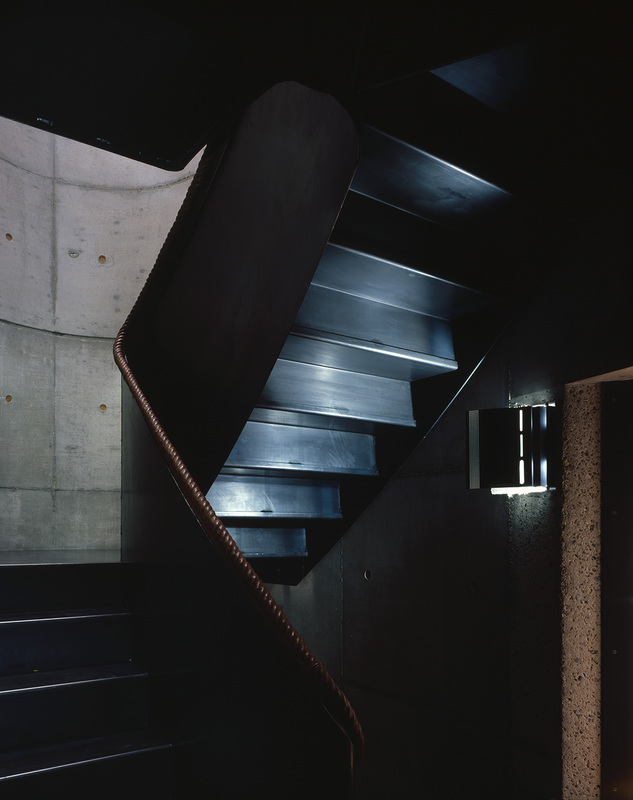 Entrance to House D.
Walmer Yard by Peter Salter. House A underside of black steel staircase with leather covered rope handrail. Walmer Yard by Peter Salter. 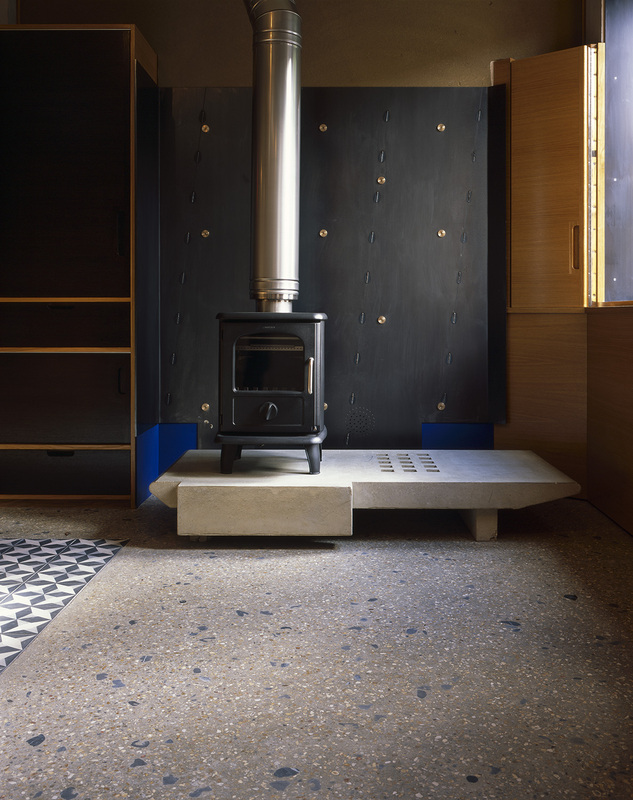 Concrete hearth to woodburning stove with black steel fire back, House A kitchen. Walmer Yard by Peter Salter. 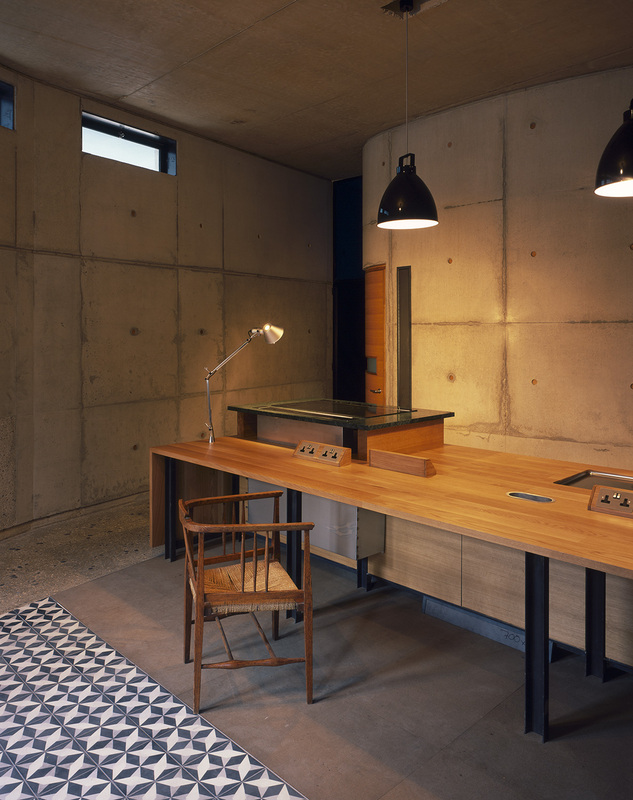 Cooking table to kitchen House A.
Walmer Yard by Peter Salter. 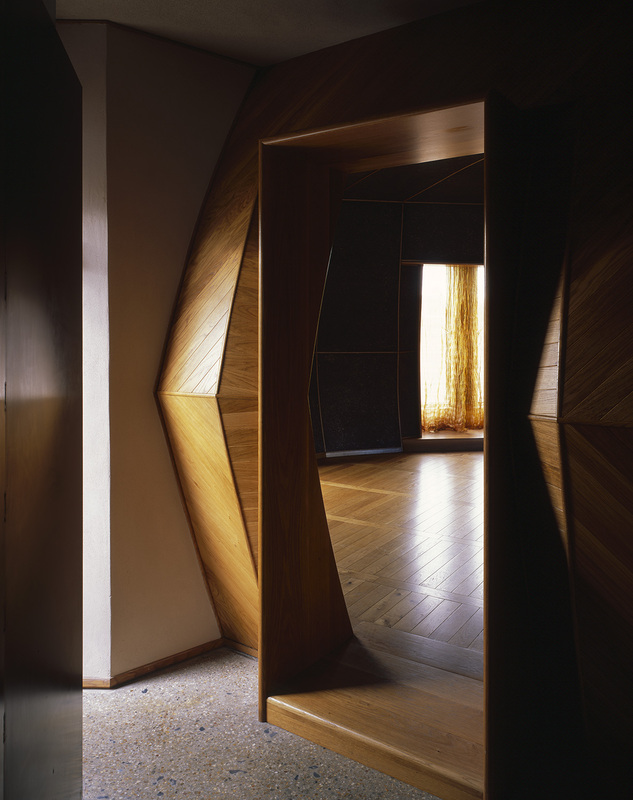 House B bedroom with private balcony, showing curve of black steel shower. Walmer Yard by Peter Salter. 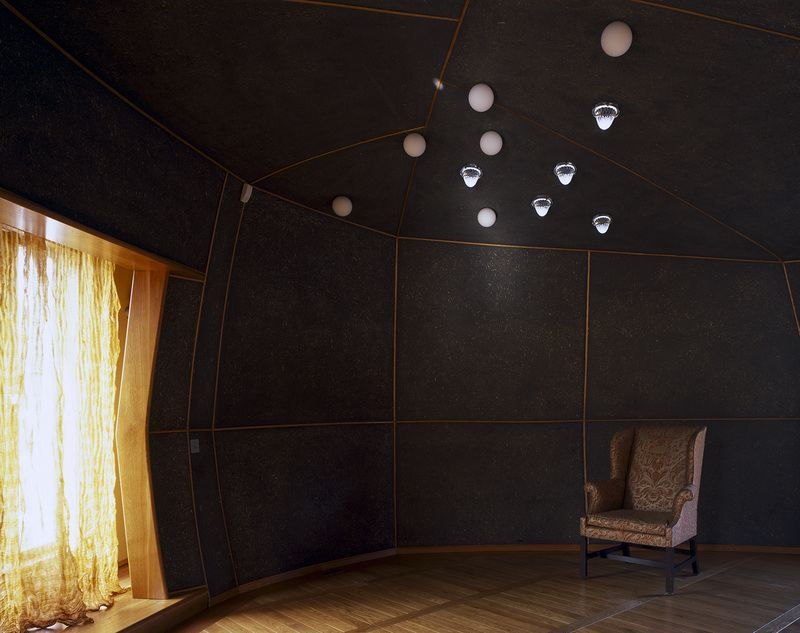 House A yurt interior with Fortuny covered chair and copper curtain. 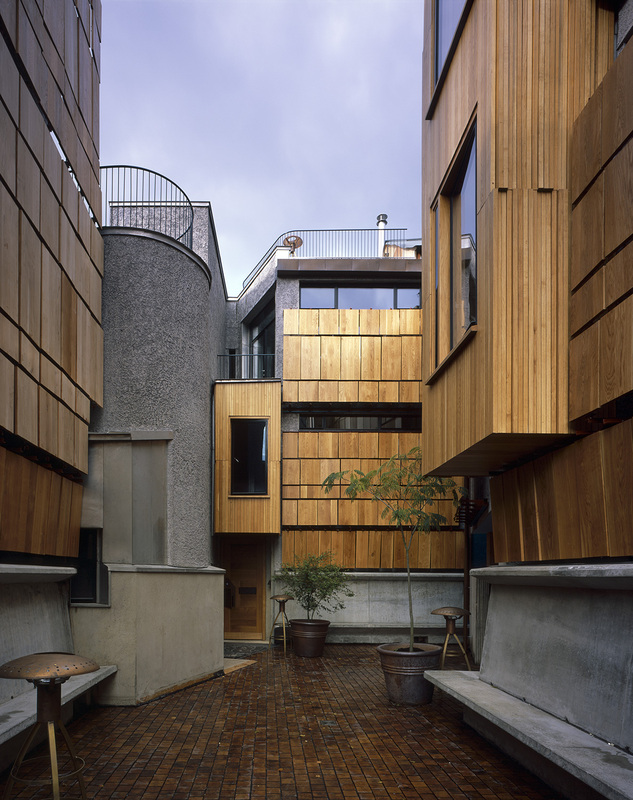 Walmer Yard by Peter Salter. 'Skycatchers': view of House B yurt from House A yurt and balcony.